Traction Company is a workshop in the purest sense: a foundation literally embedded with old trolley tracks that dig into the entrance gate. The space is gigantic and utilitarian, with three story high walls and exposed rooftop tresses. A group of thirteen PAFA alumni and recent sculpture graduates congregate in this space to share their enthusiasm for building, working alongside one another on a daily basis. 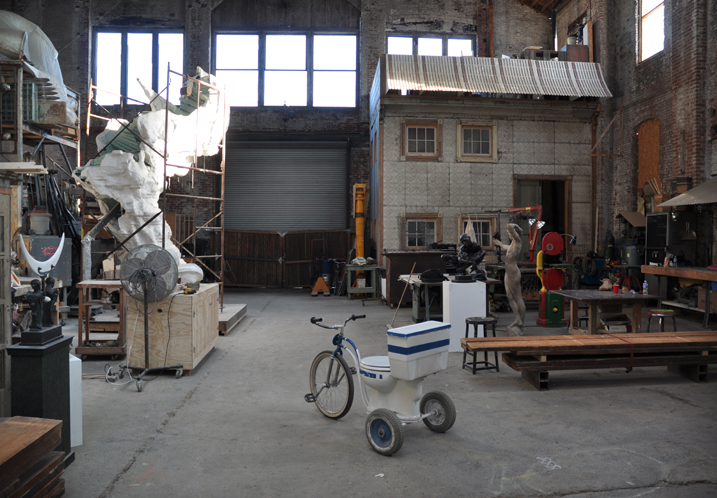 Each artist fabricates his or her own studio, from the ground up. Every Friday, the group mobilizes to work on the building itself. The communal space, with its eclectic collection of projects and tools, is a source of inspiration for their artistic practices, and their first collaborative work to date for CITYWIDE: A Collective Exhibition. Created in one-sixth scale, subTRACTION invites the viewers into the NAPOLEON gallery as giants. The viewer experiences a paradigm shift as they enter NAPOLEON, only to be met by another set of doors in which they must crouch down to pass through. With a dramatic shift in scale, the 8000 sq. ft warehouse of Traction Company has been transformed into a working Playscale Miniature, the 1:6 scale of action figures standardized in the early 1960’s by Mattel’s Barbie and G.I. Joe. 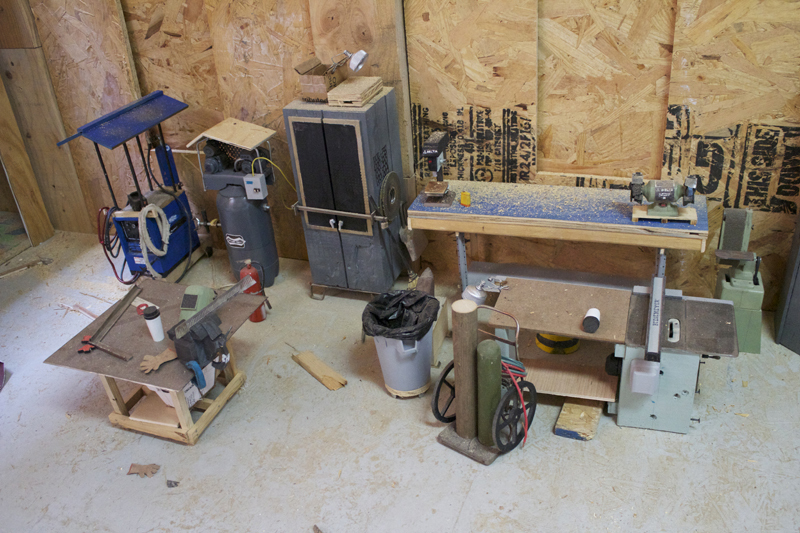 The space is fully furnished with machinery, stacked working spaces, and tools of all sizes and functions. It appears to be in the midst of activity, with gloves and tools casually placed the table, as though the members have left their posts for a quick break. 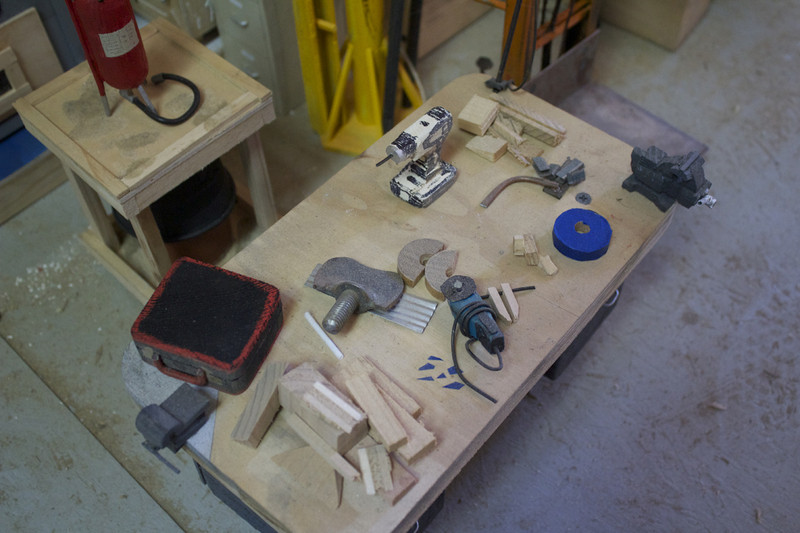 The objects are created from various materials, all born from the studio itself- a Tupperware container creates the slop sink basin; a recycled coffee cup becomes the trashcan; actual saw dust is sprinkled over the miniature machinery. In the back room, floater walls display collaborative artwork from the NAPOLEON artists, executed impeccably in a one-sixth scale by its members to replicate the original If I Told Him: A Completed Portrait of Picasso pieces on display as part of the CITYWIDE exchange. Steven Millhauser, in The Fascination with the Miniature, describes how “the miniature seizes the attention by the fact of discrepancy [from the original object], and holds it by the quality of precision. The miniature strives toward the ideal of total imitation. The more precise, the more wonder-compelling.” (132) In subTRACTION, the shift in scale encourages a slow, close look while the eye searches for detail and precision in relation to the original object. Upon entering, delight begins to unfold: fully functioning miniature cabinets with security locks and handles, a rotating clamp flood light from Home Depot built from a silver sprayed bottle cap, even a tiny Lowe’s bucket filled with casting slip that can be picked up with a thumb and forefinger. A glance above shows a small pair of white sneakers hanging up in the high rafters. The realization of the absolute enormity of Traction Company suddenly becomes clear. Members of Traction have, in fact, made everything in their warehouse to scale and the viewer has become both giant and dwarfed in the process. The fear of the gigantic is eclipsed by the miniature. Millhauser describes: “unlike the gigantic, the miniature is without dread. Here lies part of its secret charm. We allow ourselves to surrender completely, untroubled by danger. We hold aloof from the gigantic, fascinated but appalled; we yield to the miniature in sensual self-surrender” (130). Part of the reason that subTRACTION is so enjoyable to experience, is that the viewer is permitted to look closely, without fear, and by the act of seeing, he or she is seduced to touch. And once an object can be touched, it can be possessed. Millhauser notes, “large objects especially elude us. We cannot possess a house the way we can possess a chair, we cannot possess a chair the way we can possess a cup, we cannot see things with true completeness….a dollhouse allows us to possess a house in this way, to see it more completely.” (130-131). When the miniature succeeds in its function, the viewer is able to see everything he or she expects to see, and more. subTRACTION provides a heightened vantage point – a bird’s eye view – in which the viewer can see boxes, rolls of tape, dowels, tucked into the nooks and crannies of the structure, defying gravity itself. subTRACTION allows the viewer to see what is impossible to see in real life – everything. From finger skateboards to erasers in the shape of food, miniatures have a magical quality to that allows the world to seem boundless. The members of Traction Company embody that spirit by finding these possibilities in their materials, not only in miniature, but also in real life. The oxyacetylene cart that lives in the warehouse was made from old wheelchair, while the solid oak floors of the stacked second floor came from RAIR Philly, a recycling center in Northeast Philadelphia. Old-fashioned sculptural ingenuity and a can-do attitude frame their space. By transcribing their creations into a miniature scale, Traction Company invites viewers to partake in the criss-crossing potentials of function and play. In subTRACTION, there is no need to stand outside the yellow lines, to wear hard toes shoes and safety goggles. The viewer is free and safe to enjoy the magic and malleability of materials. subTraction, (Detail), Traction Company for CITYWIDE: A Collective Exhibition, 2013. Janette Chien is a visual artist and writer from Hong Kong who lives in Philadelphia. She holds a BA in English and a BFA in Studio Art from Tufts University and the School of the Museum of Fine Arts, Boston. She has written for Title Magazine, Printeresting, and NAPOLEON and exhibited work in Boston, Salisbury and Brooklyn. She currently works at SpArc PDDC as a Program Specialist for their Cultural Arts Center. More info on her artwork can be found at http://janettechien.wordpress.com.